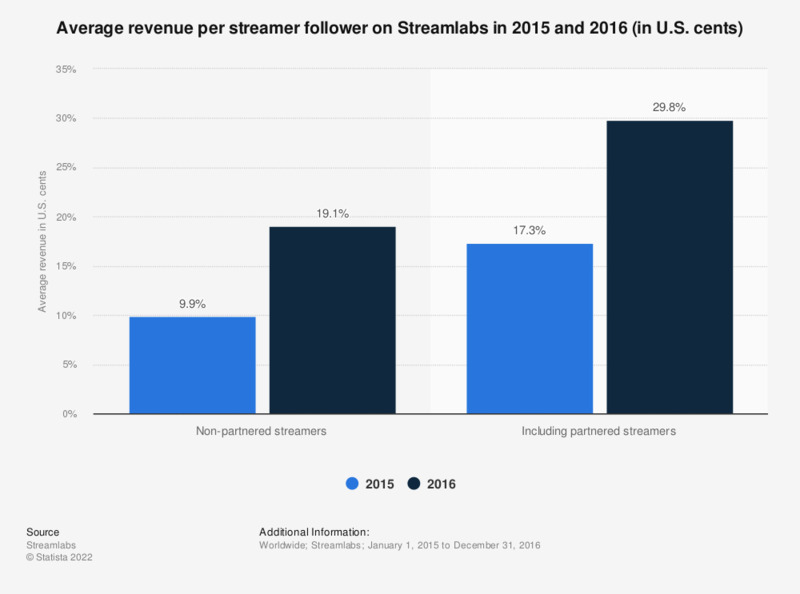 The statistic shows the average revenue per streamer follower on Streamlabs in 2015 and 2016. Certain gaming content broadcasters rely on tipping as a source of income. According to the source, non-partnered streamers processed via Streamlabs earned 19.1 cents per each follower, up from 9.9 cents a year earlier. The source provides the following information on the methodology: "This report applies only to individual streamers and not to Esports teams or organizations. It does not include data from other streaming platforms such as YouTube Live or Beam. Average revenue per follower (ARPF) is calculated by dividing total income by total followers for all streamers using Streamlabs." Do you stream-download film for free?